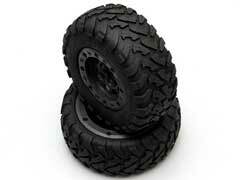 Off Road Truck Tires - Which Ones To Consider Buying? Off Road Truck Tires – Which Ones To Consider Buying? When shopping for custom truck accessories it’s important to identify what your primary uses will be for that particular part. For instance, if you want to test your truck by taking it off road buying off road truck tires will be essential equipment for your ride. There are many different off road truck tires on the market. The key is to find ones made by the top brands that offer drivers durability and superior handling. Off road truck tires like the Federal 285/75r16 Mud Terrain Tires are a perfect example of this. These are top of the line as they offer outstanding performance for drivers looking to take their vehicles on tough terrains. They accomplish this through its design, which clear debris and substances so these off road truck tires can provide excellent handling and consistent traction no matter what surfaces you drive on. Further, these tires are durable. The advance thread is designed to resist chips and cuts so you can receive the maximum life out of this part. Additionally, the deep shoulder lugs provide exceptional control regardless of whether you are on a paved surface or a rugged dirt path. Along with this model, the BFGoodrich All-Terrain T/A KO Off-Road Tire 265/75R16123SR is another excellent tire for drivers to buy. These have features like a rim protector and TriGard 3-ply polyester material that protect the tires from hazards and cuts. Best of all, the wider grooves ensures you receive the best traction. These are two of the best truck tires to buy. They both offer outstanding performance features and are designed to withstand the toughest conditions. For all their benefits they offer drivers, you can have peace of mind in knowing that both will help keep you safe when driving through tough conditions. If you would like to buy either model you can visit your local auto parts store or online retailers like Amazon. There you can find other accessories or parts for your ride like off road rims and truck snow tires.